Addis Ababa — Africa should stop exporting much-needed jobs to other continents and invest in its pharmaceutical industry, in particular, to provide for its people and create jobs for its unemployed youth, Economic Commission for Africa's (ECA) Executive Secretary, Vera Songwe, said Tuesday. "The health and wellness sector has the potential to create 16 million jobs. We should no longer export those jobs. We should bring back those jobs," said Ms. Songwe. She continued: "By 2030, an estimated 14 percent of all business opportunities in the health and well-being sector globally will be in Africa, second only to North America with 21 percent. This is a huge opportunity for the private sector." Ms. Songwe urged governments on the continent to work with the private sector to ensure there's access to health by all on the continent. "We know that a happy Africa is a productive Africa. We know that a healthy Africa is a prosperous Africa. That is the purpose of this forum - to say we should no longer be exporting those jobs," the ECA Chief said. Africa's business magnate, Aliko Dangote, in a message read on his behalf, said governments from both developed and developing countries were increasingly looking at public-private partnerships (PPPs) as a way to expand access to higher-quality health services by leveraging capital, managerial capacity, and knowhow from the private sector. "As a businessman, and through Aliko Dangote foundation, I am committed to working with governments and key stakeholders for the development of impactful health initiatives in Africa," he said. 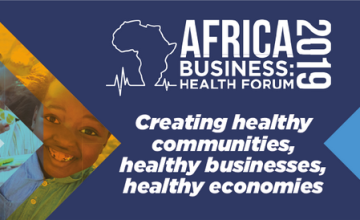 The inaugural Africa Business: Health Forum took place on February 12th in Addis Ababa, Ethiopia, on the margins of the 32nd African Union Summit. The forum brought together public and private sector industry stakeholders to advance health outcomes on the continent. Following on from the Forum will be the goal to build the African Business Coalition for Health (ABCHealth), a private sector led coalition of companies and philanthropists who will come together to positively transform health care for Africans growing population. "I believe that private sector leaders have a strong role to play. In the past, I have in my country charged business leaders to commit at least one percent of their profit after tax to support the health sector." Aigboje Aig-Imoukhuede, Founder and Chairman of Africa Initiative for Governance (AIG) and Co-Chair of GBCHealth, said Africa's government alone cannot solve the continent's health challenges. "We have no alternative but to turn to the private sector to complement government funding. That is why we have gathered here in Addis Ababa today to see how together we can fix health in Africa. The private sector and the public sector working together as partners have the potential to change Africa's healthcare from doom and gloom to progress and results," he said. The Forum was also attended by Ethiopia's Prime Minister Abiy Ahmed, Djibouti's President Ismaïl Omar Guelleh and President Mokgweetsi Masisi of Botswana. For his part, PM Abiy said; "The private sector should play a vital role in financing and supporting national health plans on the continent. It is indeed part of their corporate social responsibility," said Prime Minister Abiy, adding the rush for access to health by all should, however, not compromise quality. Mr. Masisi said mobilizing expertise, financial resources and innovations will go a long way towards improving Africa's healthcare. "In Botswana we are open and are collaborating with the private sector in improving our health sector. More can still be done," he said. The President of Djibouti said; "No country can achieve economic development without a physically, mentally and socially fit population."